- choose ANY 60 (or 90) images from this library – some may be more appropriate to your business than others – ALL are plumbing-centric. - provide a series of say 10 sets of TEXT (or 20, or 30) to become the basis for FB POSTS – after this set have been posted they will RECYCLE ongoing, with a different IMAGE until all 60 have been used, then the images will also RECYCLE. 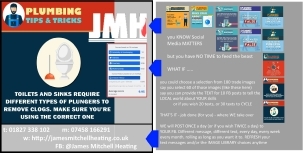 - YOUR LOGO will be overlaid on each image you choose to use – plus your CONTACT info in the way you can see on the image above TO THE LEFT HALF (the left half is the ACTUAL size of the FB image posted together with YOUR text). SECURE your placement with us.